26-11-2015 : TNPSC VAO Exam Maximum Age Limit - News in Dinamalar Newspaper Today. The news claims that Honourable Supreme Court and Madras High Courts have made judgement that there should be no age limit for the Graduates for applying Government Examinations. TNPSC VAO Exam is applied by more than 10 lakh candidates per year. Nearly 10.5 Lakhs Candidates have applied for TNPSC VAO Exam 2014 and more than 11 Lakhs candidates applied for the year 2013. The reasons for this more number of applicants is because the qualification for VAO Exam is SSLC / 10th Std Pass and the respect given for Village Administrative Officer post. What is the Minimum Age Limit to apply for VAO Exam ? The minimum age limit to apply for TNPSC VAO Exam is 21 Years for all categories. When is the condition for age limit ? Age limit in the TNPSC VAO Exam will be considered from the 1st July of the particular year. For example, the date restriction for age limit of TNPSC VAO Exam 2015 is 01-07-2015 . It means that, on 01-07-2015 you have to be complted the minimum age limit and not to exeed the maximum age limit. 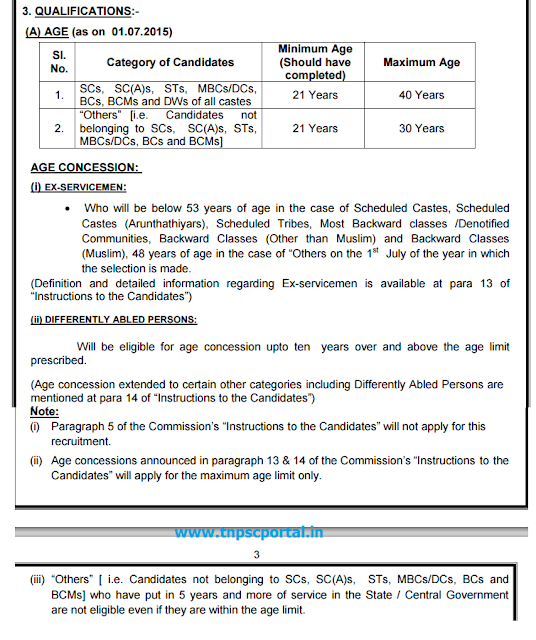 What is the Maximum Age Limit for the TNPSC VAO Exam ? Persons with disabilities will be eligible for age concession upto ten years over and above the age limit prescribed.